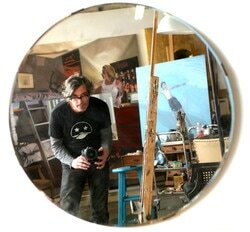 ​David Denniston is a painter operating out of a studio at 400 West Rich in Columbus Ohio. He primarily works in oil. Currently Denniston is in the midst of working on a series that blurs the lines between fact and fantasy. Using a house in Franklinton, Ohio Denniston has converted several rooms into curated stage like environments with dramatic lighting for posed scenes. The series involves a rotating cast of six characters that he uses as models for these situational paintings. These characters combined with a ever-changing sets create a fictional family facing real life scenarios. Recipient of "Mary Lou Chess Memorial Award"
Chris Gaitten "Who's the woman in the red dress?" Jesse Tigges "David Denniston's latest series represents big changes"
Garth Bishop "Power to the people"
Matthew Barnes "400 Artist Spotlight"
Garth Bishop "German Village Art Crawl"